Which Colleges Do You Have the Best Chances of Getting In To? Whether you know exactly where you want to apply or need to narrow down your college choices, our state-of-the-art prediction models calculate your percentage chances of admission, so you don't have to base important decisions about where to apply on unreliable guesswork and opinions. You can feel confident and know where you stand by finding out your percentage chances of admission. Our Ivy League-educated experts combine our admissions expertise with advanced statistical analysis to calculate your percentage chances of admission at the colleges you're considering. Knowing where you stand at your top choice colleges can help you plan your campus visits and application strategy while reducing the stress that is right around the corner. A great planning tool for juniors! See if you are on track to get into your top choices or if you should retest. Ensure that the list of colleges you're considering includes a range of reach, likely and safety schools. Your personal percentage chances of admission based on 100+ variables and unique algorithms for each college. 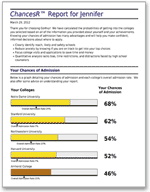 Each college's overall admission rate to help put your chances in perspective. One revision of test scores, class rank, and/or GPA for the colleges selected on original order. Money back guarantee for incorrect predictions. A free revision of test scores and/or GPA is included in the price of each report. Providing your profile information takes about 10 minutes and your report will be available within seconds thanks to our powerful technology. Unbiased, accurate admissions assessment provides students and parents with actionable insights. Unique algorithms for each college analyze 150+ variables from your admissions profile and are updated regularly. The only admissions prediction service to track its accuracy (>90% accurate since 2001) and offer a money-back guarantee.